Escape the pressures of daily life in the tranquillity of this private cliff top retreat with gorgeous sea views. Three level house with plenty of space and privacy. 28 years old with inside repainted 5 years ago and outside painted in 2018. Light airy ambiance - high ceilings, lots of windows and light coloured walls and ceilings. Terracotta tiles in kitchen, dining, lounge, rumpus, bottom bedroom and bathrooms. Carpet elsewhere. Middle floor with open plan dining, kitchen and lounge. Full laundry, bathroom, and 2 double bedrooms with queen size beds. A full deck runs around all these rooms and provides access to the large salt water pool. Comfortable, casual furnishings for a relaxed feel. Lounge has wood burner, large TV and DVD. Large kitchen with plenty of bench space; new fridge/freezer; 2 dishwashers; espresso coffee machine; oven and gas hob. Upstairs is the master bedroom with queen size bed, ensuite bathroom, walk-in wardrobe and deck. Next to this is a smaller bedroom with a single bed and access to the deck. The bottom floor has a combined rumpus / bedroom with 3 single beds. Bathroom with shower, toilet and basin. Foosball table. 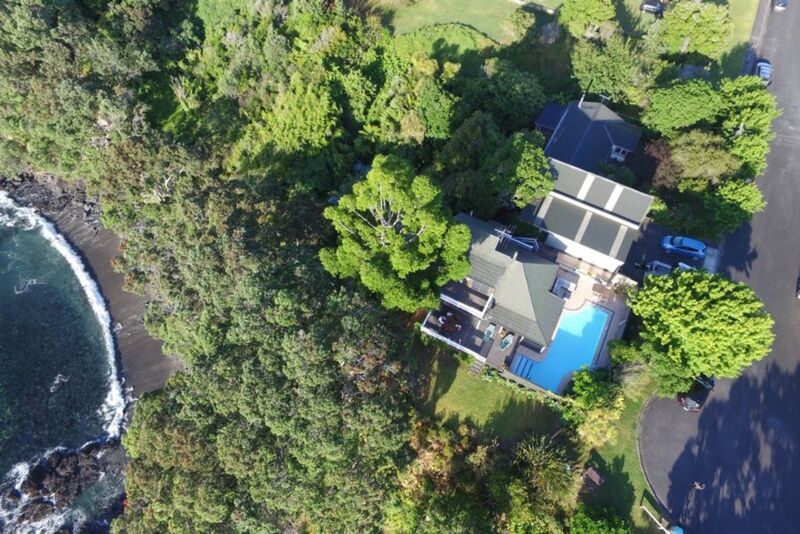 Lush tropical terraced garden fringed with stunning Pohutukawa trees and spectacular sea views. Abundant bird life. Wake up to the soothing sound of the sea and the birdcalls fom Tuis, Wood pigeons and other native birds. On the middle deck adjacent to the pool is a gas BBQ, 2 sun loungers and outdoor dining furniture for relaxed outdoor living. Not toddler safe - pool safety fenced but high decks with railings a small child could potentially fall through. Please note that Leigh does not have town water supply - all water is tank rain water so guests are asked to kindly conserve water. This property is ideal for families; couples; or responsible groups of friends. If you intend partying this is not the place for you, sorry. This is a tranquil area with full-time residents nearby - parties are not permitted. Guests need to bring towels andamp; linen (sheets, pillow cases). Duvets are summer weight, so in winter you may want to bring extra bedding. We love animals but no pets allowed on this property. Bond of one night applies. Refunded after inspection to check no damage/loss andamp; the house left tidy. I'm originally from Timaru and Mark was born in the UK but lived in many cities around the world and in NZ (an RAF brat). We have been living in Auckland for 23 years and have 2 daughters (Emily and Imogen). We like outdoor sports and love our dog and cat (Aly and Skat). We fell in love with the house and the area some 7 years ago. At the time we were looking around Matakana but buying and living in Leigh is we think much nicer with a great community feeling. This house is unique and like living in a tree house. Private salt pool which looks out to the sea. Sea views from every bedroom and all living areas. The house has a log burner and we supply the wood. There is a grass area in the front and a walkway down to the bay side. The house looks directly at the ocean and every room except the bathrooms have water views. The house has a bay below which is visible from the house - you can and people do swim there. The bay is sandy in places but otherwise rocky and is ideal for snorkle or scuba. The house sits directly on the cliff above the ocean. This house is a waterfront property. We had an amazing time staying here. The swimming pool is amazing, the house is well cared for and well-laid out and has everything you need.We found that the rumpus room is down separate outside stairs so we couldn't let our 6 and 9 year old kids sleep down there. They would have loved to but we all enjoyed the foosball. The house was in a great location with lovely views and good access to the water. The house was in a great location with lovely views and good access to the water. However, we felt that the property was a bit tired and in need of an update, particularly given the amount we were paying. There were also a few minor details that the owner could address quite easily, such as the lack of wine glasses (there were just a few plastic ones) and providing a hair dryer. They could also replace the washing machine which wasn't working properly. Great location with lovely sea views from all rooms. What an amazing place! The house was so great, we had trouble getting out of the pool to explore everything that Leigh/Matakana has to offer! Very accommodating owners also which makes the stay that more comfortable. Plenty to do around Leigh and Matakana. It is a well known tourist spot.